9,416 foot Bierstadt Lake is one of over a dozen pretty glacial ponds accessed via the Bear Lake Road, on the east side of Rocky Mountain National Park, and although quite easy to reach it is far enough from the road to escape the crowds often present at the two closest lakes (Bear and Sprague). Unlike other lakes at higher elevations, Bierstadt is surrounded by trees rather than bare rock so is not quite as scenic, yet the high mountains rising to the west provide a grand backdrop to the tranquil waters, which are lined by tall grass that takes on a deep yellow hue in late summer. Two paths lead to Bierstadt Lake, both about 1.3 miles long. One (open to hiking and horse riding) begins at a trailhead alongside the Bear Lake Road, 6.6 miles from the US 36 junction - from the rather cramped parking lot, the trail climbs 600 feet in less than a mile, via many switchbacks over a mostly treeless hillside, then passes over flat, wooded land to the southwest corner of the lake. The alternative path, for foot travel only, starts from the far side of the large car park at the shuttlebus station (5 miles from the US 36 junction), from where coaches transport visitors further along the Bear Lake Road during the busy summer season. The trail climbs slightly more (800 feet) but is generally less steep, has no switchbacks, and encounters a greater variety of scenery; this is the route described below. 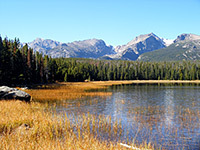 A third option to reach Bierstadt Lake (2 miles, 300 feet elevation change) is to start at the main Bear Lake Trailhead. 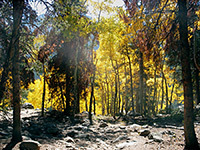 The path sets off from the shuttlebus parking lot into the pine woods and very soon arrives at a junction with the Lower Bierstadt Moraine Trail, a 1.1 mile route that stays fairly level, traversing the hillside a short distance above the road and leading to the alternative Bierstadt Lake trailhead. The main path continues up the hillside, gaining height more steeply as it climbs a fairly exposed slope partly covered by new growth aspen, giving nice views of the mountains to the south - topped by the highest summit in the park, 14,259 foot Longs Peak. The trees change back to pine and the trail turns north, flattening out for a while then starting a steep ascent up a bouldery slope at the edge of Bierstadt moraine. Loose rocks underfoot mean that some care is needed on this section. The woods remain quite dense, restricting the views, as the land becomes less steep and the path reaches a T-junction marking the start of a 0.9 mile loop all around Bierstadt Lake, though as yet there is no sign of any water, just an impenetrable thicket of small, closely growing trees. The lake comes into view after a short walk north or south, and while the official trail stays in the forest, a little way from the shore, a fainter path goes right along the water's edge. The lake is quite shallow, ringed by grass and reeds with just a few rocks along the north shore. 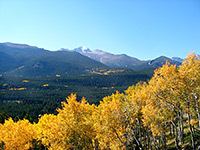 The level surroundings allow for an obstructed panorama of several mountains along the continental divide (see 360 degree panorama), including Taylor Peak, Otis Peak, Hallett Peak, Flattop Mountain and Notchtop Mountain. The loop has three other intersections, with paths to Bear Lake (2 miles), Mill Creek Basin (1.3 miles) and the upper Bierstadt Lake trailhead (1.2 miles).